For more information on IRIS Compatible Alarms visit our FAQ site: IRIS Compatible Alarms. For more information on IRIS Compatible Alarms visit our FAQ site: IRIS Compatible Alarms. The First Alert ZSMOKE is a z-wave protocol smoke alarm. This battery operated alarm will operate with 3rd party, certified z-wave Devices enabled with the First Alert protocol and the basic Command class required by all z-wave Devices. By the requirements of the device class Spec, this Command class does not have to be mapped to any particular functionality for this device. The alarm supports one association group with up to 1 node, and sends its alarms to that group. Note: this alarm is not compatible with Onelink. 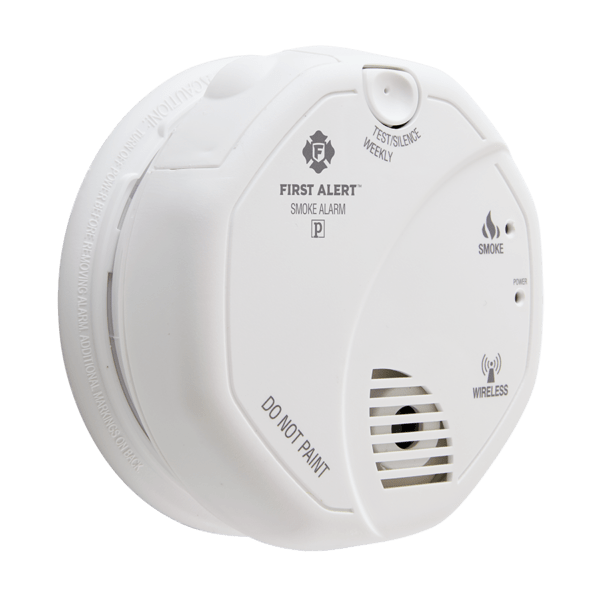 The First Alert ZSMOKE alarm comes equipped with a photoelectric sensor to provide the earliest possible warning of fire. The sensor is optimized to detect larger smoke particles produced by smoldering fires, such as those caused by unextinguished cigarettes. It also distinguishes between real threats and smoke and vapor produced during showering, cooking, and other everyday activities, helping minimize the number of false alarms. A patented smoke entry system helps ensure reliable detection by providing a direct air pathway to the sensor. The battery-operated smoke alarm installs in minutes, without requiring an electrician. The unit requires two AA batteries, and features a chirp and indicator light to let you know when they need replacing. The alarm mounts easily to a ceiling or wall, and comes with pins to secure alarm to the base to prevent tampering. The integrated wireless alarm system is Iris compatible to send you mobile alerts and emails, so you’re aware of dangers after the alarm is activated, whether your’e home or away. The alarm is also compatible with 3rd party, certified z-wave devices with the First Alert protocol.